Young Suzie Smith is talking about the new collaboration between two giants of a very different nature – H&M and Versace in an interview with British Vogue . On November 17th 2011, following the footsteps of Lanvin, Karl Lsgerfeld, Stella McCartney and Jimmy Choo, Versace for H&M was available in stores and online. The mass hysteria was crazy. This collection was so highly anticipated that thousands all over the world camped in front of stores for up to 22 hours. The collection was sold out in under 30 minutes and many pieces arrived on ebay just minutes later describes the author of the fashion blog Fashion in the Urban Jungle! H&M websites simply broke down because they could not handle such a large number of visitors. But not only fashionistas wanted something from that line but also small business owners were looking to snap up the coveted Versace label at a cheap price t then sell it a higher one in their own stores. What is it that makes people go nuts over a fashion line? First of all, I have to pay tribute to the design of the collection designed by Versace’s creative director Donatella Versace! In another blog called Carina 100 I found amazing descriptions of the collection. It is a fantastic lookbook with amazing, 90s-stylee, “print- tastic” designs. Great fabrics and beautiful finishes! What makes it so special is that it takes a look back at the past of the brand that was dominated by leather, loud prints and riot of color. Another thing that makes it special is that they also designed some pieces for men focusing on sharp tailoring as you can see on H&M’s website. But as we know, great designs are not the only thing that matters! The marketing for this collaboration was exceptional! Starting with preparation: Already two months before H&M and Versace published the good news, Versace had LadyGaga announce that for the next two months she will only be wearing Versace retro designs which can be read on the Telegraph’s site. As she is a fashion queen for most people, Versace got back into people’s minds. After the deal was signed, H&M did a great job with their ads for the campaign. The publicity for this collaboration had to be significantly more high-end than for previous designer collaborations. They created an entire runway show just for the purpose of showcasting the upcoming collection. The commercial that can be seen on TV is very well-done as well – from the music in the background to the choice of models. Interestingly, part of the deal was that it includes a higher financial commitment from H&M for advertising and promotions. On the blog of Nathan Branch you can find more information about that. However, one might wonder why a label like Versace that stands for exclusiveness and uniqueness would want to go into mass production. The reasons are of economic nat ure. As Suzie has mentioned, it is the only way ordinary people can afford it. What does that mean for Versace? Diffusion lines and designer collaborations are the only way to stay ahead in a recessionary economy Nathan Branch goes on. They sustain demand for fashion designers. Ultimately, all designers will have to alter their business models with products aimed at different price ranges. These collaborations capture a younger and less wealthy demographic. They also change the image of a brand. 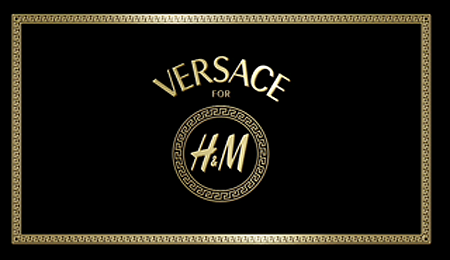 In the upcoming year, Versace will see increased revenues and profitability due to the fact that they have become closer to their customers and due to the additional marketing sponsored by H&M. Although I can understand why these collaborations are done, I see it similar to Suzie: It is just not the same! Nevertheless, I could not resist and I just had to order one of the pieces! Why? Whatever objections people might have, in the end we all feel the same about prêt-à-porter. I learned that it does not matter how you feel about it. In fashion and marketing as well it is more important how the product can make you feel. This is what brands should think about andthe collaboration with Versace proved to me that H&M is good at analyzing its customers. Although it might just be a cheap retailer it acquired a deep understanding of what prêt-à-porter is all about and was able to use that for business purposes. In addition to that, I learned how many different opinions and interesting facts can be found on blogs. Whether you agree with these people or not is not the point. It is about enriching your own perspective and writing. I’ve been wondering as well why Versace would commit to a collaboration with H&M. Your post explains it perfectly from different perspectives but without loosing yourself throughout the text. Research-wise I won’t give you a long list of links, as I believe that you did a good job and found an amazing load of information. Your post is very well written and very well structured and makes it very interesting to read. Great Work..